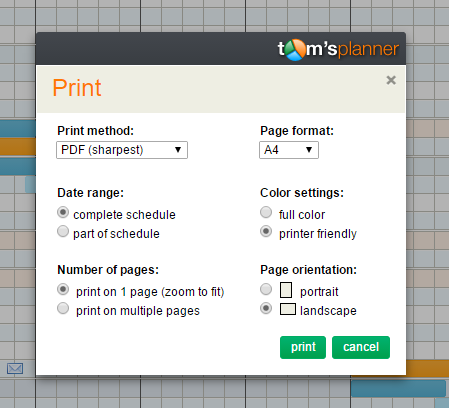 To get a printer friendly version of your schedule, click the ‘print schedule’ button in the toolbar. A print dialogue will appear in your screen that allows you to adjust the print settings of your schedule. You can select which print method you prefer: PDF or through an image file. Click the print button and a new browser window will open which will load a PDF file containing the printer friendly version of your schedule. Loading of this PDF file might take a while but should not take longer than 60 seconds. To open the PDF file you will need Adobe’s PDF reader which you can download here for free.